I just got back from a week at John Campbell Folk School in North Carolina. I drove up about two and half hours from South Atlanta on Sunday and made it in time to register and attend the orientation. I met my classmates and the instructor and we went over to our classroom for our initial instruction before we came back to the dining hall for supper. John C. Campbell Folk School is located in the lovely Great Smokey Mountains of western North Carolina near Murphy. It was founded in the1920’s and is still going strong with something like 800 classes taught each year. Instructors and students come from all over and live in dorms on the campus and have meals family style in the dining hall and then collect for a “Show and Tell” at the end of the week. Last week they had Marquetry, Woodturning, Woodcarving, Wool, Photography, Blacksmithing, Cooking, Native Flute, Collage, and Pottery as I recall. Something to aspire to, but overwhelming on Day One. 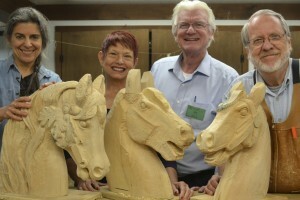 I went to Campbell this time to take a course in carving the head of a carousel horse. The instructor was Ira Chaffin, who runs a sculpture studio over in Birmingham and is a skilled instructor endowed with loads of patience for a bunch of beginners. 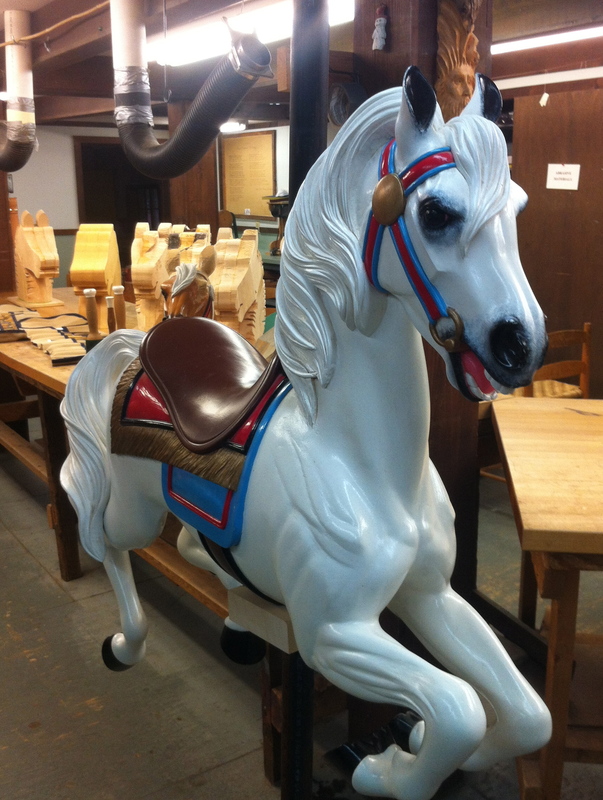 I learned that since carousels in America turn counterclockwise, the decorations are mostly on the right side of the horse to be visible to folks waiting in line. 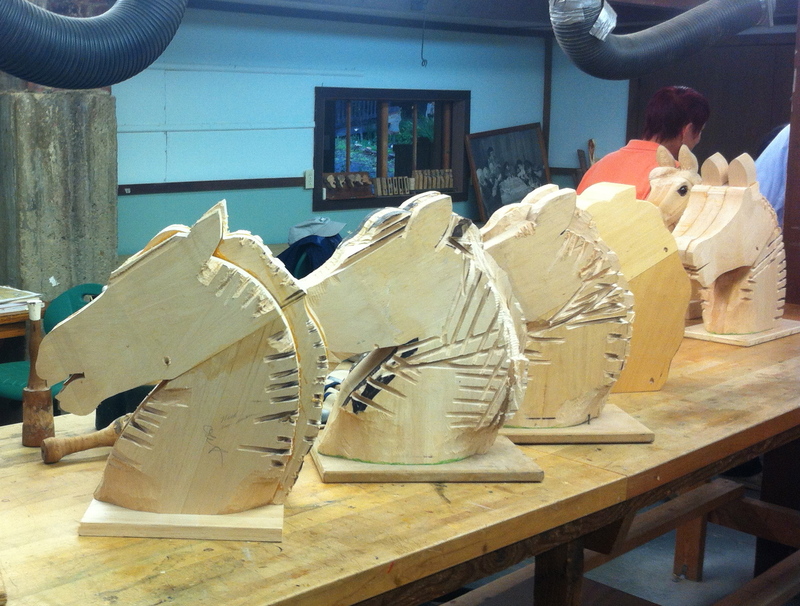 Horses are different sizes depending on the row — inside, middle, or outside, where they will travel. Outside horses are bigger since the outside row is longer. We started the week with whatever tools we had all brought with us, along with tools furnished by the school, and Ira’s personal tools, plus band-aids all around. I personally started the week with a purist attitude about the tools. If you don’t use classic carving gouges and a wooden mallet, then you are not paying proper homage to the profession. Grinling Gibbons would have been proud. By the end of the week, if I had brought my chain saw, I would have been there with it. Anything to get the wood off and get a horse head. Ira furnished a carving blank glued up out of two by basswood planks on which he traced a pattern. He cut the horse head on the blank which gave us a good start. After some discussion about grain and how to handle it with a chisel, we were off. One of us had no experience at all, one had lots of woodworking but little carving, and the other was in the class for the second time since she wanted to do some extra on her head. With only three students, we each had lots of instructor time. The first day, we carved and carved and carved and then after that we carved some more. And after we had carved a while longer, it was time for lunch. Want to hear the cliches? “Carving is easy, go down to the skin and stop.” “I just look at the block of stone and take away everything that doesn’t belong.” Basswood is soft at the beginning of the day when the tools are sharp. As the day wears on, the tools start to lose their edge, and you get tired, then the wood gets tougher. By the end of day three, it is like carving walnut burl. When you are just beginning, the biggest fear is carving off too much wood and getting to a place where you can’t recover. 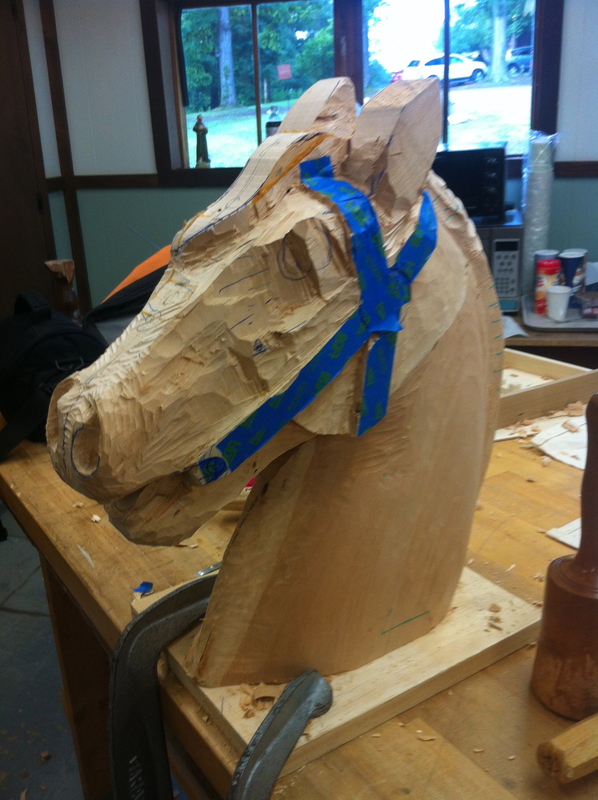 The only thing to do is to keep carving down until it gets right again and then you may only have a colt head instead of a horse head. I came up with a new invention, which I am going to try to have the High stock from now on. It answers that fear of too much removal perfectly. I call it the “WoodPutterBackerOner”. I could sell a million of ‘em. Especially at the wood carving school. I had a great time, I got a decent horse out of it, I met some nice people and I got out of town for a week. I recommend it highly. By the way, I named mine Dan Patch after the song lyric from “The Music Man’ about trouble right here in River City “… stuck-up jockey boy sitting on Dan Patch”. You can look it up.